30,000 folded paper moths make up the exhibit Black Cloud. Most nights you won’t find two large piles of logs blocking Queens Quay in Toronto. But at Nuit Blanche, you can expect the unexpected. Once a year, the all-night art festival takes over the downtown core from dusk until dawn. Harbourfront, the University of Toronto campus and city hall were particularly popular locations Saturday night with many exhibits. The event included four large exhibitions as well as over 50 independent projects. Fourteen exhibits will remain set up for public viewing until October 12. One of the extended projects is called There Is No Away. Created by Sean Martindale, it is a corridor of garbage that borders the sidewalk on the east side of city hall. Piles of colourful aluminum and other refuse were packed and tied together to form walls that reek like a real-life landfill. Information boards accompany each piece to explain the artist’s thoughts. 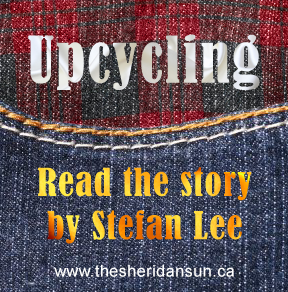 There Is No Away points out society’s wastefulness – and that everything thrown out has to go somewhere. Another exhibit that will be sticking around temporarily is Black Cloud by Carlos Amorales. 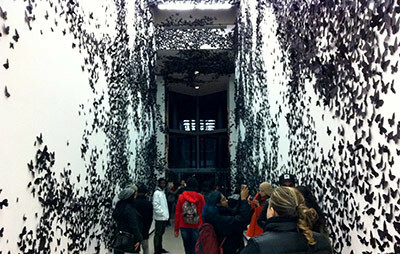 Located in the Power Plant art gallery at Harbourfront, it features 30,000 pieces of cut and folded paper – forming a dense swarm of black moths. The piece dates back to 2007 and has been installed in numerous locations around the world. The sheer quantity of paper moths is intimidating and the insect-like quality of the exhibit lends it a creepy feeling. Not every exhibit can stay up for a week or more but some of the single night events were very interesting, causing many festival goers to stay out all night trying to see it all. Surgery was an exhibit that involved an interactive mock surgical procedure. Men and women in scrubs were hurriedly wandering in and out of a makeshift operating room that had been set up in a tent. They handed out masks made of plastic and cloth to people lined up outside on Wellesley Street. “It’s sort of a collaborative art piece done by Sunnybrook,” said Sivan Keren Young, the hospital’s manager of digital communications. Festival-goers had the opportunity to scrub up and be walked through a basic medical procedure. “We came in, we were told we were just in time,” said Schaefer after completing the operation. The piece also featured clips of surgical procedures from the 1940s to present day projected onto the wall of the centre. Other exhibits included a pile of dancers imitating a glacier melting, a film of Bernadette Käfer playing a 35,000-year-old flute made from the bone of a griffon vulture, and a time-lapse video shot from a window of the Robarts Research Library depicting a light snow. The event, sponsored by Scotiabank, was the 10th edition of Nuit Blanche in Toronto. Added by Daniel Mallett on October 6, 2015.